Barn owl, Dee Estuary Nature Reserve. 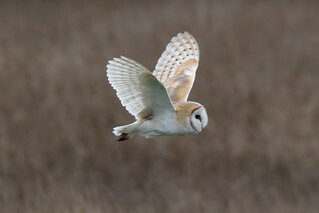 After several attempts, I finally caught up with the local Barnie, seen here hunting for small mammals, it repeated the same circuits for around 45 minutes, amazing to watch, saw it catch a couple of voles/mice. You do forget howl small these birds are. This was was taken at 560mm and is still quite a large crop, this image was from the closest pass of the afternoon.